To edit photos in Photoshop Elements, you need to import them into the Photoshop Elements Organizer. Most people have photos on their computer’s hard drive, as well as on removable media, such as CDs or maybe even a USB flash drive. Adding images from your hard drive is easy. If you have a source such as a USB flash drive or a CD, you copy files from the source to the drive where you store photos, or you can copy files into the Organizer directly from the removable media. Click the Import button in the top-left corner of the Organizer to open the drop-down menu and choose From Files and Folders. 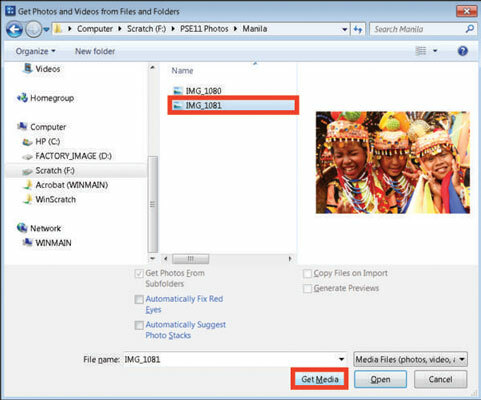 Alternatively, you can open the File menu and choose Get Photos and Videos→From Files and Folders. You can also press Ctrl+Shift+G (Cmd+Shift+G on the Mac). The Get Photos and Videos from Files and Folders dialog box opens, as shown in the figure. Browse your hard drive for the photos you want to add. You can import individual images, a single folder of photos, or a folder and all its subfolders. Select files or a folder and click Get Media. When you add files to the Organizer, the image thumbnails are links to the files stored on your drive. They aren’t the complete image data. Your catalog in Elements grows as you add more images, but the growth is miniscule compared with the photo file sizes. To copy files from CDs, DVDs, or a USB flash drive, you can open the external device and drag photos to your hard drive. You can also choose File→Get Photos and Videos→From Files and Folders and import photos directly from the external device. By default, the Get Photos and Videos from Files and Folders dialog box copies your media to your hard drive when you click the Get Media button. You can deselect the Copy Files on Import check box so that only thumbnail images will appear in the Media Browser. To edit a photo, you have to reconnect the CD or DVD to your computer. If you elect to copy the images, the photos are available for editing each time you start a new Elements session.